A Junior Leadership Team is group of students who are elected to represent the views of all pupils and work together to improve their school. We follow a democratic process to elect the Leaders. If pupils wish to become a Junior Leader, they must complete a short application form expressing why they feel they will be a member of the team. They then present their views to their class and a secret vote takes place. At Mulgrave we have two representatives for each class that form part of the Junior Leadership Team. The Junior Leadership Team meet staff every week and discuss issues that are important to the children. They have an agenda which they create, a member of the Junior Leadership Team takes the minutes and another chairs the meeting. They Junior Leadership Team meet with the governing body regularly to share their work with them. They also have an input into the monitoring of the impact of the changes and improvements across the school and they contribute to the school Self-Evaluation document (SEF). How can you become a member of the Junior Leadership Team? Junior Leaders must model our School Values and our Golden Rules at all times. Please click here to see our Junior Leadership Team programme for this term. Please click here to meet our Junior Leadership Team. Our KS1 Junior Leadership Team went to visit the Mayor of Woolwich, Councillor Olu Babatolaon on Thursday 24th November. They were really excited when they were given a tour around the Town Hall and the Chambers and allowed to try on the Mayor’s robe! When Damilola was asked how he felt, he replied that he was 100% excited about meeting the Mayor, When the Mayor was asked how he felt about becoming Mayor, he said (looking at Damilola) 100% excited! The children thoroughly enjoyed their visit and were a credit to our school. The Mayor has said that he plans to come and visit us soon, which we are really looking forward to. Representatives from the KS2 Junior Leaders visited the Houses of Parliament on Monday, 14th November. Shelianna in 6 Elm commented that she had learnt the role each MP and Governor played, which she found educational, yet fun and exciting. 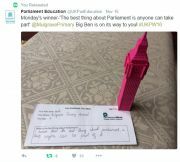 Norah, in 5 Cedar was the lucky winner of a competition that Parliament Education runs – ‘the best thing about Parliament is…’ by writing ‘the best thing about Parliament is that anyone can take part’. Norah has won Big Ben! Norah has said that this trip has inspired her and that it is what she wants to become more involved in politics? when she is older.